When we have time on the weekends, I love to play with Chhori and spend some quality time with her. We do role plays and she loves it. I am always the “baby” and she is always the ‘mama”. Sometimes she surprises me with a dialogue that I had said months ago. Last week as we were doing a dress up, I dressed her up in a sari and accessories like chura (bangles), pauju (anklet), bindi (head gear), sachika (red head tie). She looked absolutely adorable and I really loved it. I just love all these little things that I am able to do with my cutie pie. I know one day she will grow up and will stop playing dress up with me but until that day, I will enjoy every minute of it. 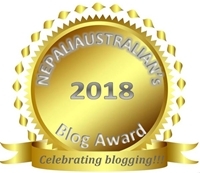 This entry was posted in Being Mum, Our daughter and tagged anklet, australian, bangles, bindi, chhori, Chura, daughter, dress up, head gear, M from nepaliaustralian, momma, Nepal, Nepali, Nepali blog, nepali blogger, pauju, red head tie, sachika. Bookmark the permalink.